The electro-hydraulic 2-post lifts of the SPO-series convince by an outstanding pick-up area. The control system is available in a manual and an electric version, as well as different column heights. 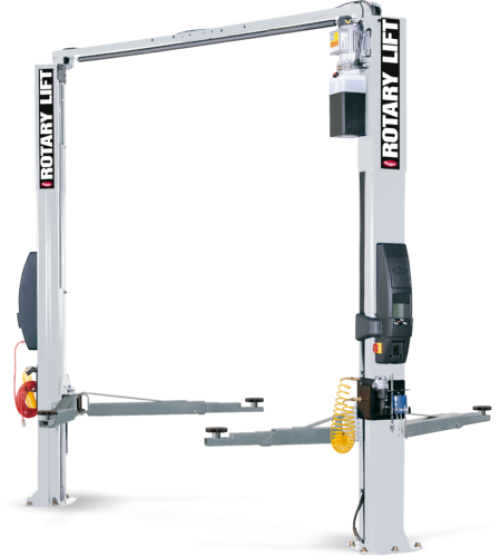 The maximum drive-through width with minimum external dimensions and the construction without a base frame ensure problem-free access to the lifting platform. The double S-profile of the lifting posts enables maximum stability with minimum space requirement. The contact area of the lifting carriages guided in the lifting posts is significantly increased too. The rotating plates are pluggable and can be extended or replaced with attachments in a stable and cost-effective manner. For a plus in ergonomics and economy, the 2nd control panel is standard on the SPO40. One control unit is equipped with a 220 V connection (fused with 16 ampere for electric hand tools) and the second with compressed air preparation. The upper safety switch-off effectively protects vehicles with a higher overall height from damage during lifting. The electro-hydraulic design with only one unit ensures energy-saving operation with fast lifting and lowering times. Flanged to the upper part of the lifting column, the unit is protected from external influences and allows more freedom of movement. The support arms are automatically locked when lifting. Once the platform is completely lowered, this locking device is released automatically. The particularly fine grid and a manual unlocking function extend the ease of Operation.